As I said in the previous chapter, we are now entering into the thick of the things. In this chapter, I will explain some important principles for you to control your trajectory and your speed. (The following explanations will not deal with the turns). 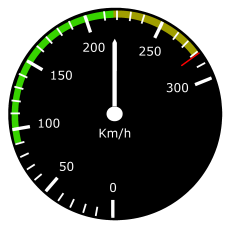 The anemometer displays the speed of the aircraft (in km/h on this exemple). 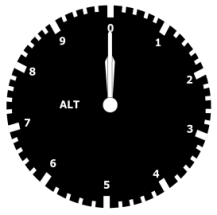 The altimeter displays the altitude of the aircraft (in feet on this exemple). The vertical velocity indicator displays the climbing or descending rate in feet per minute. So it gives you information about your vertical speed. This instrument is less used than the previous two ones. To simplify my explanations I will not thereafter take the vertical velocity indicator into account. When you are able to control the values displayed on these instruments, you will actually control your trajectory and your speed. 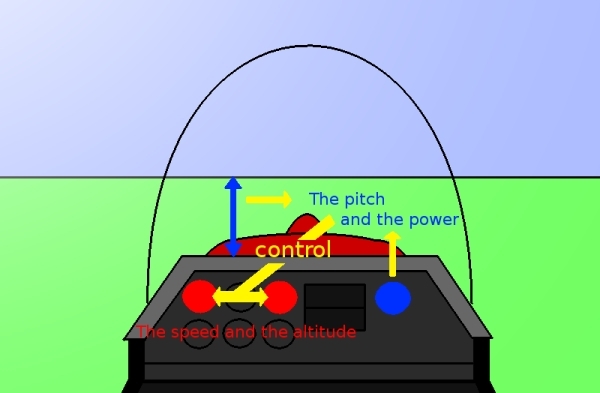 The pitch is the most important element to control the trajectory and the speed of the plane. The tachometer displays the power delivered by the engine in rotations per minute (RPM). To get the number of rotations per minute you have to multiply the value displayed per 100. To control your trajectory and your speed, you have to keep the right pitch and the right power. The other instruments are merely checking instruments. If you keep a wrong pitch or a wrong power, because you are focused on the wrong instruments, you will never stabilize the right speed and the right altitude at the same time. The power being relatively steady after being set, you will have to look at the pitch as often as possible to keep it on the stance you have chosen (see the schemes above). 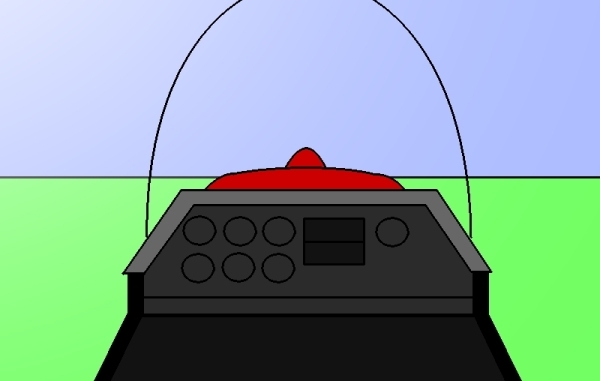 Piloting while looking at your pitch also enables you to see and avoid the aircrafts coming ahead (which is essential). One more time, I stress this notion of pitch control. The common mistake of inexperienced pilots is to try to correct the speed by focusing on the anemometer or the altitude by focusing on the altimeter. This is a huge mistake. They will never stabilize the right speed and the right altitude at the same time, and they will waste their mental capacities for nothing. Furthermore, they will not be able to avoid the other aircrafts (Do you drive your car without looking outside? Well, don't do it piloting a plane, incoming obstacles are faster). Speed and altitude are controled using pitch and power. You have to keep your pitch stable. 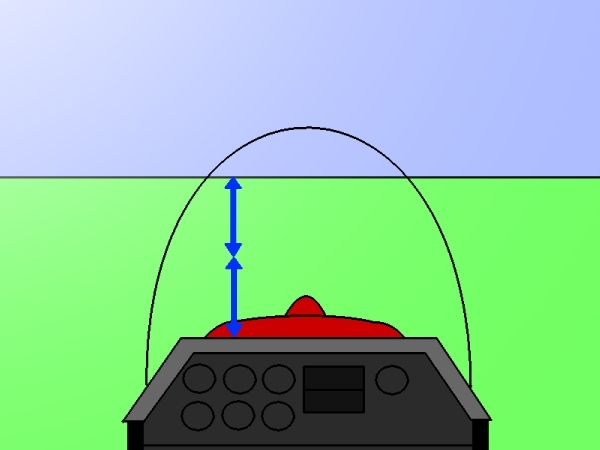 This pitch can be estimated keeping a distance of about one hand (arm extended) between the skyline and the hood of the plane. 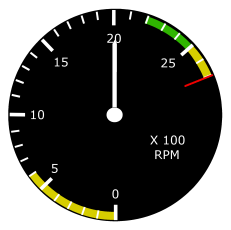 You have to set 2500 RPM on the tachometer (if you stay leveled your speed will be of about 190 hm/h on DR400/120). If your altitude is still increasing after having stabilized your pitch and set 2500 RPM, that's because your pitch is too high. So you have to keep a lower pitch by maintaining some more distance between the skyline and the hood. 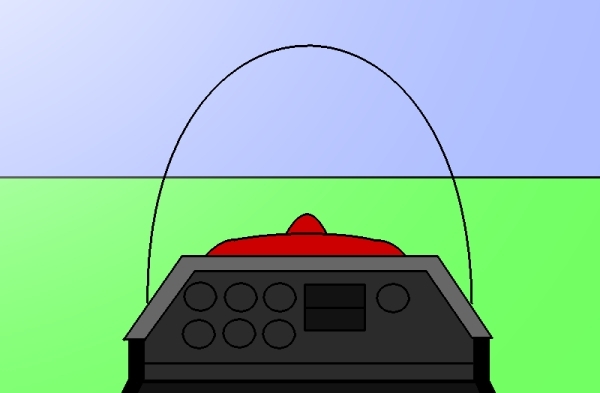 On the contrary, if you are still loosing altitude after having stabilized the pitch and the power, you have to keep a higher pitch by maintaining less distance between the skyline and the hood. To get set in descent, you have to lower your pitch and reduce your power simultaneously in order to keep a constant speed. If you begin your descent with cruise power settings, the aircraft is going to accelerate increasingly, which is not what we are looking for. On a DR400 120 horses power, a setting of 1900 RPM enables you to hold 190 km/h with a correct vertical speed (in feet per minute given by the vertical velocity indicator). If you have the right power setting with a too high pitch, your speed will be below 190 km/h. On the contrary, if you have the right power setting and a too low pitch, your speed will be over 190 km/h. If you have set a too high power setting (for example 2200 RPM) you will have to maintain a higher pitch than the one normally required to keep 190 km/h but your descent angle will be smaller (so the verical speed will be lower). On the contrary, if you have set a too low power setting (for example 1700 RPM), you will have to maintain a lower pitch than the one normally required to keep 190 km/h by getting the energy the power didn't give you by loosing altitude more quickly. But your descent angle will be wider (and your vertical speed will be higher). Full power is needed to get enough energy to climb. So the only way to control speed will be by maintaining a higher pitch to get slower, or a lower pitch to get faster. As we have seen how to establish cruise, descent and climb, I'm now going to tell you how to control speed. But first, I'm going to give you some explanation about the force which enables the aircraft to fly : the lift. Contrary to what we could think, the force lifting the plane is created by the low pressure standing on the upper side of his wings. 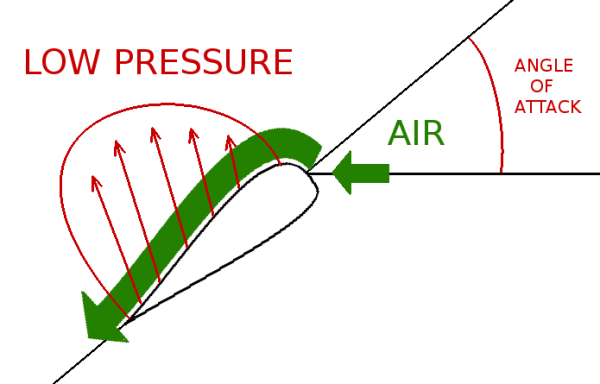 This low pressure is created by the acceleration of the air going along the airfoil. The air pressure, thus accelerated, decreases. 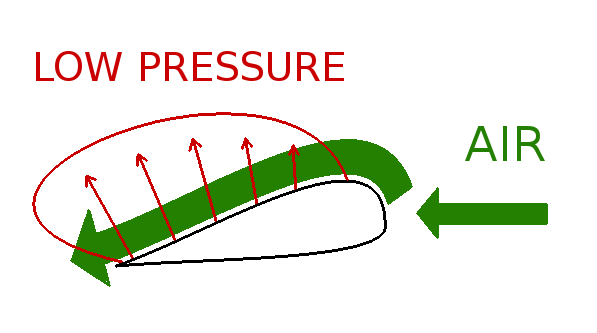 The higher the velocity of the air incoming on the airfoil, the lower the pressure and so the more important the lift. The higher the angle of attack, the lower the pressure and the stronger the lift. Ok but how can you fly leveled in cruise with a high angle of attack ? As a matter of fact you need to keep a constant lift value to fly leveled. When the speed decreases, there is less lift generated by it, so you can get the lift back by increasing the angular value of the angle of attack. On the contrary, when the aircraft is accelerating you must decrease the angle of attack to get less lift from it because you will gain more lift from the speed. If you go too quickly to the pitch used to stay leveled at 130 km/h, while your speed is still above, you will have too much lift and your plane will climb. On the contrary, if you increase your pitch too slowly, your plane will lose altitude. You have to set full power, and decrease gradually your pitch to the one you have when you are leveled in cruise. Then when reaching the cruise speed, set the cruise power setting (2500 RPM). as it takes some seconds to set power, you can anticipate and begin to set it slighly before reaching the desired speed. Why do you have to set minimum power instead of setting directly the power needed to hold 130 km/h? If you proceeded this way, the deceleration time would be too long. For example, if you set 1900 RPM at 190 km/h, the number of RPM will have decreased and will be below 1800 RPM when you reach 130 km/h, compelling you to adjust the power setting anyway. On the contrary, if you set 2500 RPM at 130 km/h, when you reach 190 km/h, the number of RPM will have increased and will be above 2600 RPM compelling you to adjust the power setting anyway. This influence of the speed on the power is an unwanted conception side effect. That's it! This is the end of the chapter. You may take a 10 minutes break if you wish. See you on chapter 3 when you feel ready !